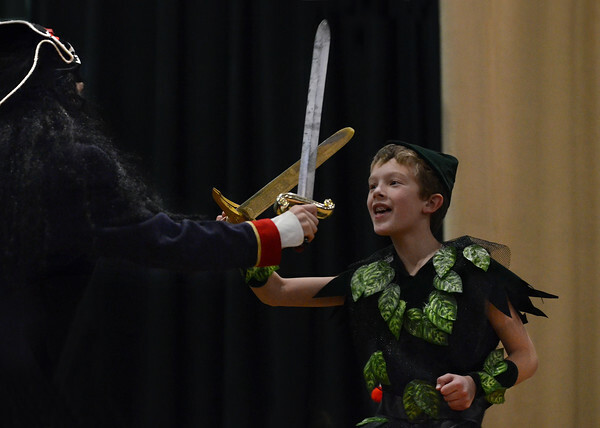 Peter Pan, right, played by Tyler Weed, faces off in a sword fight with Captain Hook, played by Ian Buchanen, in a performance Tuesday of "A Christmas Peter Pan" by West Parish Elementary School fifth graders at the O'Maley Middle School auditorium. In the story, Peter Pan and Santa Claus are kidnapped by Captain Hook and his band of pirates, so Tinker Bell summons Wendy, Michael and John to join her on a rescue mission to the North Pole. The play was performed Tuesday for the entire West Parish student body, and will be presented Wednesday and Thursday evenings at 7 p.m. in the O'Maley auditorium. Admission is $5.